I am super excited to tell you about a item I was so lucky to try!!! 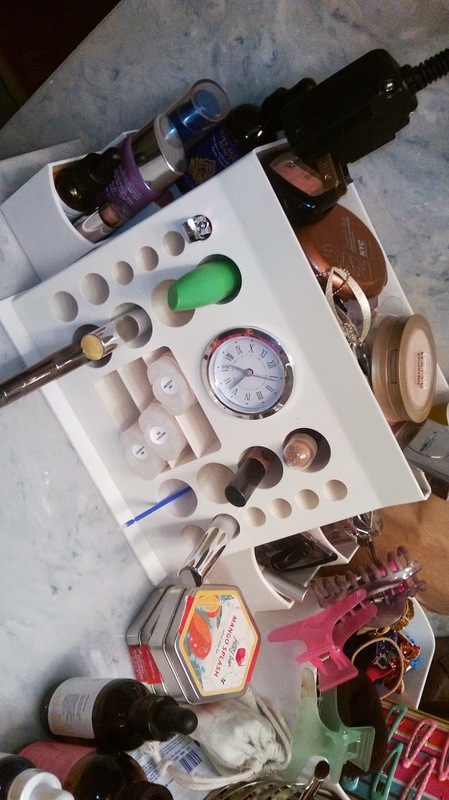 It is the Lips-n-Eyes Cosmetic Organizer this organizer is amazing it holds my everyday makeup stuff. Now I am a makeup junkie so it doesn't hold all of my makeup but.. it holds what I need to use for the day. I store it in the bathroom on the counter right where I get ready in the morning. Just make sure that for the deeper compartments to put a piece of cotton or something so it doesn't fall all the way in the hole so you can't get it out. Lips-n-Eyes Organizers may be placed on the counter as shown, or can be wall mounted. The two parts may also be used separately. To create more storage space, you can use the main body on your counter and hang the tray with side pockets on the wall. The tray may be used to hold personal hygiene items or pedicure tools. It's also perfect for men's toiletries. If you have an especially short item that wants to slide down into a tube and disappear, place one or more cotton balls into the bottom of that compartment to adjust the depth. Some Lips-n-Eyes™ users who don't need a clock, remove it and use the large compartment to store Q-Tips or cotton balls. Most women love the clock and you can even hide small valuables in the "secret compartment" behind it. I usually have my makeup organized in one of my dresser drawers. I have my favorites in one shoe box, and the rest in another. I organize in clear acrylic containers. Not at all. They're thrown into a basket.